I’ve been meaning to watch I’m Not There since its 2007 release. I finally got around to it. While it’s no longer on the New Release list, I thought it was interesting enough to warrant an examination and a review. Bob Dylan was white hot and everywhere. Then he had a serious motorcycle accident that broke his neck in several places, cut up his face and forced him into a long period of recovery that slowly gave way to a phase of relative seclusion. We really don’t know what happened on that Triumph. The big accident story is one version of the truth. Others say that an uncoordinated Dylan barely made it out of his manager’s driveway before accidentally falling off the bike and that he sustained only minor injuries. There’s a version of the story with an oil slick. One claims that a sun-blinded Dylan panicked at high speed. He wasn’t hurt. He was hurt. He was severely injured. He was on life support. There’s probably some conspiracy nut who thinks the real Bob Dylan died and that a doppelganger replaced him (just like Paul McCartney). Who knows? It happened or it didn’t. It was minor or nearly fatal. Maybe we should just ask Bob. Well, people have asked Bob. And he’s given at least three different explanations of the accident himself. When it comes to accuracy in reporting on the events of his life, Bob Dylan isn’t particularly reliable. If you’re going to make a movie about Bob Dylan, you’re going to need to make a choice about the motorcycle accident. You’ll tell a story, even if it isn’t the story. But the accident is just one part of a bigger life and many of the other parts are just as ambiguous. You’ll be picking and choosing potential realities every step of the way, trying to stitch something together into a cohesive biography of Dylan that wraps him up for the audience as an interesting, understandable figure. Todd Haynes found his preferred way of dealing with the motorcycle wreck in I’m Not There. He made a series of other choices, too. But he didn’t try to create the retelling of Dylan’s life. He didn’t even really try to create a retelling of the story. Haynes decided that Dylan isn’t in the pieces and that one over-arching tale couldn’t really explain the man in any accurate sense. He didn’t bother trying to make a straight biopic. In addition to the mystique and mystery surrounding Dylan, you can also attribute the decision the fact that Todd Haynes makes movies that remind you that he’s a Brown-degreed semiotician. I’m Not There doesn’t feature an actor playing the part of Bob Dylan. Instead, it has six actors playing fictionally-named versions of Dylan. Bob is a little black kid who thinks he’s Woody Guthrie. Bob is a 20th century version of poet Arthur Rimbaud. He’s an actor named Robbie making a movie about a folk singer named Jack Rollins who later becomes Pastor John. Dylan is also Rollins and Pastor John, by the way. The Jude Quinn version of Dylan goes electric–and shows us that Cate Blanchett can portray a man. Oh, and there’s also the Bob who’s an aging Billy the Kid. None of them is Bob Dylan. All of them are Haynes’ understanding of elements of Dylan or vehicles he uses to explore parts of Dylan’s story. 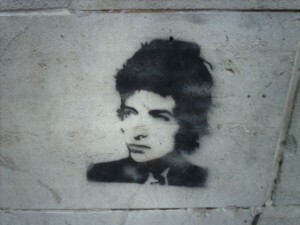 In the end, we don’t get a Walk the Line-style biography of the Bob Dylan. We get an intentional blur of fantasy, reality, history, the director’s choices and little cogs that may or may not be pieces of Bob Dylan. If you think that seems more like an academic exercise than a summer blockbuster, you’re right. But don’t let those who’d take a wrecking ball to every ivory tower and who’ve used terms like “artistic” and “intellectual” as pejoratives in their criticism of I’m Not There fool you. It’s well-made and very watchable. It also hints at something other biographies tend to ignore. By eschewing the Dewey Cox-parodied model of music biopics, Haynes gets close to some truth about Dylan. He’s not the byproduct of a single epiphany. He’s not a clean story. If you’re looking for a movie that will give you a whole, understandable Bob Dylan… Well, he’s not there. Consider Walk the Line. It’s a great movie. Joaquin Phoenix (who’s now in theaters reminding us, interestingly enough, that he’s still here) creates an utterly believable Johnny Cash. But do you think for a moment that his portrayal gave us the Johnny Cash? Cash was undoubtedly shaped by a sharecropping youth and a brother’s tragic death, but we have no way of knowing if those movie-pivotal facts were really the driving force behind the rest of his oft-tortured life and his many actions. Walk the Line was one construction of known facts about the man in black. It made for a great story, but the influences portrayed, the motivations and the man at the center of the movie were the culmination of series of choices about how to create one story. You could tell the Cash story a million different ways. Haynes settled for six, seven or eight (depending on how you count ’em up) versions of Dylan in I’m Not There. That’s still far from definitive, but it’s closer to accuracy. That’s not just a matter of mathematics. It’s the recognition of something we know about ourselves and those closest to us that we often forget when looking for the life stories of the famous–people are complicated. If someone wanted to tell your story in a movie, would you feel comfortable with the cherry-picking and oversimplification that dominates most biographies? There’s more to a life than what shows up on screen for a few hours–even for those of us who don’t have Dylanesque mystery, name recognition, popularity and cultural significance. If Hollywood ever comes knocking on my door, I’ll let them put my story on the silver screen. But I’ll ask them to get Todd Haynes to direct. I’d rather be a multi-dimensional mish-mash of fictionalized exemplars than a streamlined encapsulation of myself. I’m Not There isn’t a perfect movie. It’s not as challenging or as pretentious as some critics would like you to believe, but it’s unnecessarily murky at times (the Richard Gere as Billy the Kid sequence, in particular) and can occasionally be a little heavy-handed. However, if you go into it with a willingness to pay attention and the realization that you’re not going to get a standard biopic, you should enjoy it–even if you’re not sure that Haynes got the motorcycle accident right. Nice review. I dig it.